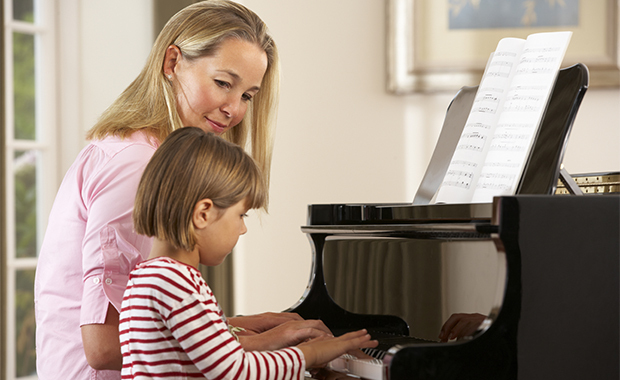 Whatever style of music your child is interested in, taking piano lessons is a good place for them to start. Before you sign your child up on a journey to master the black and whites, here are some things to know. Digital pianos are a versatile option for new students, but there are some key differences between a keyboard and acoustic piano. The main difference between the two is sound. Keyboard pianos can be used to play all types of music and are more adept to modern electronic styles than acoustic, but keyboards require the purchase of electronic pedals and don’t have the same dynamic range of a piano. Keyboards tend to have smaller keys, although some newer versions have tried to create keys that have a more realistic feel to them. If your child is currently using a keyboard, but you believe they will eventually transition to playing on a piano, you will want to use weighted keys since adjusting to heavier keys can prove tricky for young learners. Many common piano manufactures like Yamaha or Roland have tried to create digital keyboards with a more realistic sound and feel. “Graded hammer keyboards” try to mimic the resistance musicians encounter when playing an acoustic piano by having a heavier touch on the low notes and a lighter touch on the higher notes. Keyboards are a much more affordable option than acoustic pianos. Whether you buy a used or new one, a good piano can cost several thousand dollars. Pianos also require regular tuning and maintenance. The cost of maintenance depends on the age and style of the piano, but just one visit can cost $100. Portable keyboards range from $100 to $500, while digital pianos with features like graded hammer keys range from $300 to $1000. Acoustic pianos are much bigger than keyboards. A standard keyboard weighs about 50 pounds and can fit in a small corner of most rooms. A small upright piano weighs about 300 pounds, while a grand piano can weigh more than 1,000. Even the smallest upright piano will still require about four feet of wall space and can be tricky to move from room to room. Once you have the equipment, it’s time to consider lessons for your child. There’s really no ideal age to start taking lessons, but research has shown introducing music to children before the age of nine allows for a better development of musical sensibility. Children learn how to read music, technique and musical theory in piano lessons. Your individual teacher might have other topics they cover, but most lessons focus on those three main subjects. Your child will likely begin with basic exercises intended to get their fingers adjusted to playing. These exercises usually consist of practicing basic melodies over and over again. Many teachers use method books featuring basic sheet music that builds in difficulty as you move through the sequence. Once a student is more advanced, lessons can be tailored to specific areas. If a student is prepping for a recital, lessons may focus on a particular piece of music. Between lessons, most teachers expect students to practice 15 to 30 minutes a day, five to seven days a week. The amount of practice time needed varies from student to student as age, difficulty level and overall goals should be considered. A private half-hour session typically costs between $15 and $35, and some teachers offer specials if you sign up for more than one lesson. However, prices can be up to $100 an hour for an experienced teacher with a good reputation and advanced music degrees. Discuss a few options with your child before signing them up. Make sure the teacher is someone you and your child feel comfortable with, as they will be spending a great deal of time together. Quiz: What Instrument Should Your Child Play? Sam is a writer, photographer and videographer for Active.com. She loves traveling, dancing, trying new things and strength training. Sam is a graduate of the University of North Texas with a degree in journalism. Sam enjoys spending time with family, cooking and playing with her dog, Woody. You can follow her on Twitter, Instagram, Facebook and Google Plus.